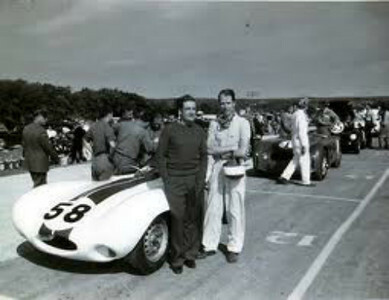 Briggs Cunningham and John Fitch with their #58 D-Type Jaguar at the Sept 8-9, 1956 Road America Enduro. They finished 2nd overall to the 4.5 Ferrari of Howard Hively and Jim Kilborn. Photo copyright Alix Lafontant.